Action Door knows the weather in Cleveland, Ohio and it’s nearby Northeast Ohio area puts a lot of wear and tear on your garage door. The combination of the sun, rain, freezing and thawing is perfect to to break springs, wear on motor and disintegrate your garage door. Most garage doors last an average of 30 years and many times it’s just a simple repair. But, what do you do when repairs are aren’t worth the hassle? Below are some tips on when to replace and how to buy a new garage door. Your garage door squeaks, grinds, rattles, or it’s just plain ugly. No matter the reason, there comes a point when your old garage door is beyond repair; it needs replaced. This may seem like a major undertaking; there are, after all, a tremendous amount of options available, from material to design style. What Garage Door Material is Best? Action Door has seen new garage door options change over their 50 years in business. They know you have a lot of options when it comes to the types of new garage doors, and each offers their own unique set of qualities and drawbacks. Many garage doors are made of steel thanks to the low cost, low maintenance, and durability. Plus, steel garage doors frequently mimic wood grain, may be painted, and arrive in a great array of design options. The drawbacks? You will want to consider an insulated door if you spend any amount of time in your garage due to steel’s poor insulating qualities. This also goes for those with attached garages, as energy efficient garages help your home’s energy efficiency levels too. Also, consider the wear and tear new garage doors may undergo during their lifetime. Steel is available in several gauge grades, or thickness, and the higher the gauge, the thinner the steel. If you expect any risk of dents or damage to your new garage door, you may want to look into at least a 24 gauge steel. You’ll even need a thicker gauge if your new garage door is for commercial use. Aluminum is the sister of steel, with as many, if not more, design options. While less expensive than steel, it is also lighter and more susceptible to dents, dings, and damage. There is no replacing the charm and appeal of a wood garage door. When painted, it may be matched by savvy steel or aluminum counter-parts, but you can’t replicate the rich, warm look of a stained garage door. Especially if you’re searching for new garage doors for your home, wood can provide a traditional complement to many architectural styles. Of course, wood requires greater maintenance and upkeep, and wood can cost a considerable amount more than steel or aluminum. 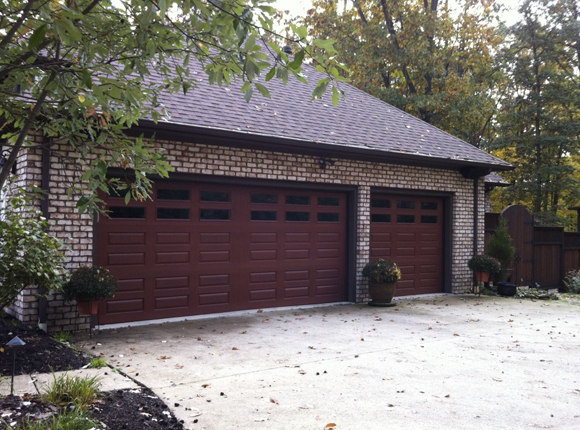 For a more durable, less expensive wood garage door, consider wood composite. Unless your new garage door will live along the coast, where salt water damage may occur, there is little incentive to select a fiberglass door. Beyond its dent resistance, fiberglass is a weak insulator and may quickly fade from exposure to the elements. What Garage Door Style is Right for Me? When you look at the immense number of new garage doors now available on the market, you can inundate yourself with design choices. And it’s not all a matter of aesthetics; as described above, various materials will impact your garage door’s functionality. First and foremost, when selecting new garage doors, aim to select a design that will well-integrate to your existing architectural style. You don’t want your new garage doors to stick out like sore thumbs; you want it to appear as if they have always been a part of your property. If shopping for a commercial garage door, this is a fairly simple endeavor; few commercial properties require a specific design over a specific material’s functionality. For your home, however, you may specifically require a traditional or modern style. This is when all those immense design choices actually become a good thing. Whether you’re living in a Spanish-style home, a traditional colonial, a century farmhouse, or a converted Tudor-style carriage house, you will be certain to find your best style match. If we can ever be of service to you for your new garage door needs, contact Action Door for a free quote or any answers to your questions. We proudly serve greater northeast Ohio region, providing garage door service, repair, and installation with the most trusted brands in the industry. Whether you require residential or commercial garage door service, you can call us at 866-366-7463.